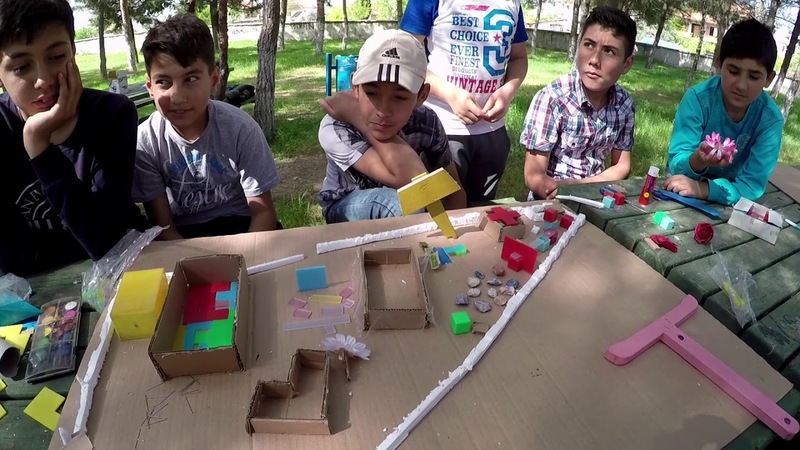 Between November 2017 and July 2018, we did an open classroom and play track project for Uşak Eşme Güllü Village Primary and Secondary School together with Istanbul Okan University Brokoli Group and Izmir University of Economics Cut Paper Group. The project was made for the garden of the school, where 120 students study, brought together 96 individual and institutional supporters and had a meaningful place among the works we have done so far with the widest participation. For Güllü, we started our work with the call of Betim Bülbül, who is one of the participants of the Abandoned Rural Schools Ovakent Project and working as an painting teacher in Güllü. We did our first expedition on November 21 to talk about the demands to transform the old lodgement into a workshop space and to improve the playgrounds. On March 9 we did our second expedition and met with the director of Eşme National Education Directorship. Since 2017, students contunie their educational life in the old municipality building, because of the school building, which is located on a 12-acre schoolyard, has received a bruise report against the earthquake. However, it was decided to use the same school yard, which is still used by students, for the outdoor lessons and increase playing units, and to place in the far corner of the yard where can be safe from the demolition and reconstruction of the school building. Simultaneously with the expeditions, we decided to run this project together with our architecture student friends from the Brokoli and Cut Paper groups, that we met in our previous works and intend to make a design that will be applied physically. Two other prominent features of this work were that it started with the invitation of a former participant and brought together 2 student groups from different schools. After the short-term expeditions, on April 14-15, we organized a comprehensive exploration workshop with the participation of Brokoli and Cut Paper and started the design work. Firstly in the pinetum, where open classroom and play track will be constructed, a workshop with the school students was made. The aim of the workshop is to express students ideas for the garden on a 1/200 scale model of the garden. After the student workshop we took the measurements of pinetum and lodgement building, walked around the village, met with villagers and talked with them about their ideas about entire school garden. We also talked about possible needs for the anticipated construction workshop in the following summer and feasibilities to provide these needs. In addition to the open classroom and play track, the requests for the transformation of the old lodgement into a village museum and the more efficient arrangement of the schoolyard for organizations such as weddings like we saw during the workshop were also expressed in these contacts. At the end of these two days, we decided on the calendar of design and construction stages. You can read the fanzine we prepared after the workshop from here. We continued the design works after the exploration workshop through regular online meetings. In these meetings, where everyone shared their ideas with the sketches for both the open classrooms and the play track, we continued to develop the designs by sharing the tasks after taking the general settlement decisions. These decisions were based on the fact that the open classroom will use 1 meter high concrete set and place on the more wooded side for the need for shade, and the play track sets will set up between the trees in a way that they could use the trees as a reference. After preparing designs for budget calculations at the beginning of June, we created a booklet and accelerated the fund searching processes. You can view our booklet here. We interviewed with companies and individuals in Uşak, İstanbul, İzmir and Ankara and reached enough amount of resources for realizing the project and went to Güllü again for the construction workshop between July 18-27. At the first day we settled in the house where we’ll stay and in the dining hall where we’ll use as our logistics center. We worked on shaping the application details of the designs for the first 4 days and providing our needs from the village and Eşme. In addition to working on paper and on the computer, we have developed produce some experiments with the tools and with some wood from the 41st Building Fair – Turkeybuild Istanbul. These woods were left over materials from the ‘Yapı Unplugged‘ workshop, in which we produced seating units for Güllü together with Assemble at the 41st Building Fair – Turkeybuild Istanbul. At our one-day off, we went to the Southern Waterfall in the neighboring South District of Denizli where we broke tobacco together with the villagers in the tobacco field. We continued the second part of the workshop with the arrival of the impregnate woods we supplied with the support of the Turkish Timber Association. After the arrival of the woods, we prepared the structural parts of units according to the cutting and merging details and measures, and carried them to the pinetum. First, we put the pieces of the play track into the field and we joined the sets together. After specifying their position, we dug the pits under each foot and poured concrete foundations to cut off the contact of the feet with water. Then, we assembled the necessary side joints and strengthened the structures of the sets. We repeated these operations for the open classroom. The open classroom and play track, which have a space between them, are aligned with each other and have been positioned in an opposing way and defined the space between as a focal area. After the settlement, we finished the workshop on the night of July 27 by completing the installation of the upper surface parts, assembling steps, ropes and nets to the play track and sandpaper and wood paste works. On the last evening, we had a celebration dinner under the bloody lunar eclipse, and the next day we left Güllü. We thank to Betim Bülbül and other teachers, to Gülsüm Abla, who helped us a lot beside preparing our meals, to villagers of Güllü for their hospitality and materials and tools support and to everyone who made realization of the dreams of children of Güllü possible with their donations changing from 5 Turkish liras to 500 Turkish liras. They reminded us the importance of every contribution. You can find the photo album of the project here. You can read our daily blog from here.